Dr. C.M. Kaliko Baker’s teaching focus is on Hawaiian grammar and worldview. His dissertation analyzed a- and o- class selection in grammatical subjects of events, i.e., as subjects of nominalizations and relative clauses primarily. His analytical methodology in his research is based in discourse grammar and pragmatics. Generally speaking, by using corpora he draws generalizations about specific structures and patterns in Hawaiian. Dr. Baker also has international research interests as well. He is part of Te Mauria Whiritoi, a Waikato, Aotearoa, based project studying the sky as a cultural resource- Maori astronomy, ritual and ecological knowledge and was funded in 2014 by the Marsden Fund: Te Pūtea Rangahau a Marsden. 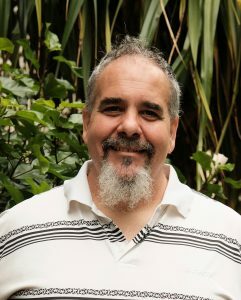 He is one of 8 scholars on the project researching relevant phenomena through an indigenous lens bringing an international perspective to Te Mauria Whiritoi. As President of Haleleʻa Arts Foundation, a 501(c)3, Dr. Baker works at supporting, promoting, and publishing Hawaiian medium media, for example, hankeaka ʻōlelo Hawaiʻi such as Kaluaikoʻolau, Māuiakamalo, Kamapuaʻa, and most recently Lāʻieikawai. Within hanakeaka as a process, he serves as researcher, writer, editor, and dramaturge. Dr. Baker has been a member of the Protect Kahoʻolawe ʻOhana (PKO) since 1993. His major contribution to the PKO has been leading the makahiki ceremonies since 2003 and as a kōkua with all media endeavors. He also represents the PKO on the Kahoʻolawe Island Reserve Commission heading all things pertaining to culture. Recently, he has been leading huakaʻi ʻōlelo Hawaiʻi under the PKO to Kahoʻolawe during UH’s Spring Break during which the UH Mānoa and Hilo campuses connect and work on Kahoʻolawe using ʻōlelo Hawaiʻi as their means of communication. As a life-long resident of Koʻolaupoko, Oʻahu-a-Lua, Dr. Baker keeps his hands in his community by taking his students to Ke Kula ʻo S.M. Kamakau in Haʻikū and volunteering at Ka Loko Iʻa o Heʻeia, amongst other things.